Born in France on November 15, 1910 in a small village near the banks of the Loire, Antoine Blanchard was the eldest of three children. His father, a carver, managed a small carpentry and furniture shop. Antoine would watch his father hand carve the furniture and began to display an artistic flair early in life. Eventually his parents sent him to Blois for drawing lessons. He continued his training in Rennes at the Ecole des Beaux-Arts studying sculpture and drawing. Upon completion he was awarded the schools highest award: Le Prix du Ministre. By 1932 he left Rennes and traveled to Paris to study. He enrolled at the Ecole des Beaux-Arts and after a few years entered the competition for the Prix de Rome. In Paris he developed a love for the city and it's street life. In 1939 Antoine got married. In September of that year war broke out and he was called up for service. In 1942 he would return to his art. His daughter Nicole born in 1944 followed in the family tradition becoming an artist working under the name A. Champeau. 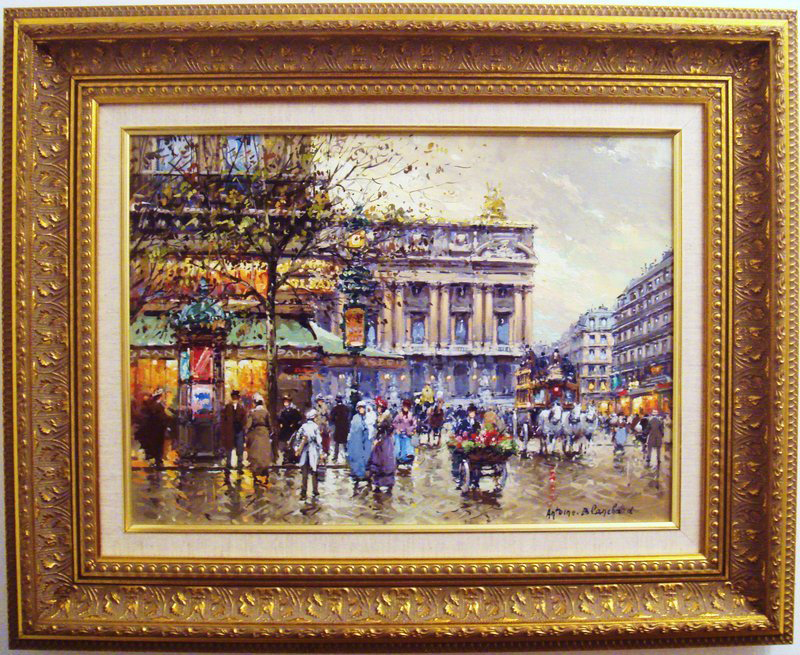 Like his contemporary, Edouard Cortes, he devoted his artistic career to the depiction of Paris through all its daily and seasonal changes. He was not an imitator of Cortes, but rather depicted the life of Paris at the turn of the century from his own point of view and with his own, unique style. His focus was on the daily life of Paris at the turn of the century. His work became highly sought after and collectors from around the world vied to acquire his new works. Today he is considered one of the leading exponents of the School of Paris painters and his work continues to be highly sought after and highly valued. His listings are extensive.